Having the ambient sound like that of an idling jet airplane, a glassblowing furnace burns, keeping the raw material molten 24/7, the flame has a constant feed from a two inch gas line, the needle on the gas meter in a steady spin. 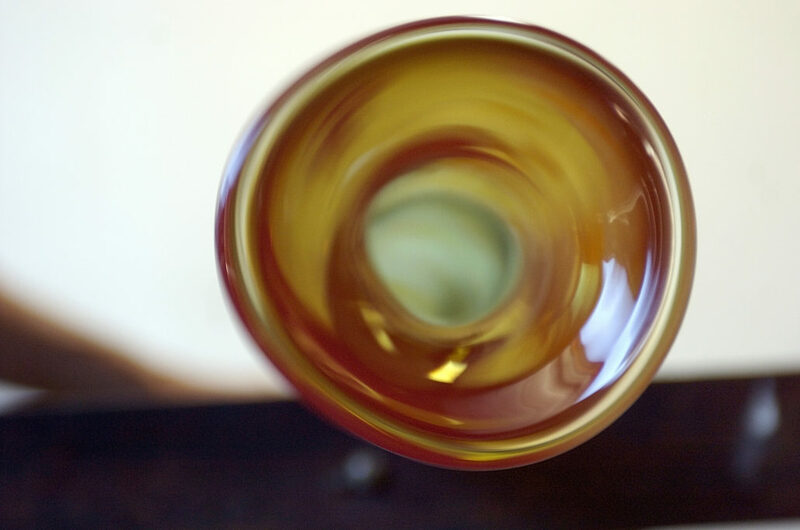 Working temperature for glass is around 2100 degrees plus or minus. The temperature is raised to 2400 degrees for about 8 hours while filling (“charging”) the furnace with silica sand, potash, soda, and lime (“batch”). Maintaining the correct temperature during this charging process is critical in order to sustain a high quality glass. 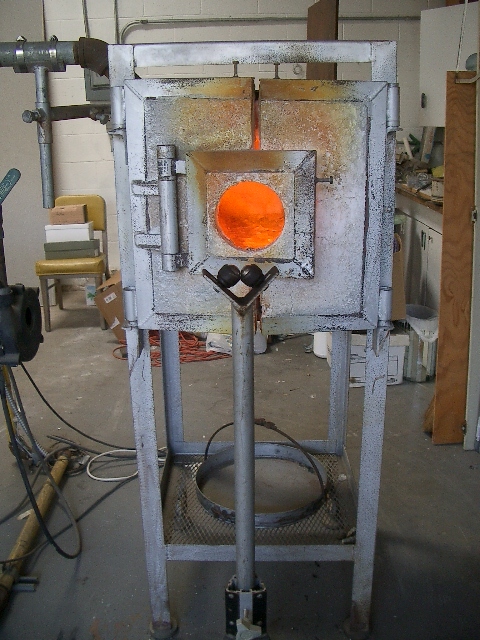 Tending the furnace is the foundational concern for a glass studio, yet only a small part what is behind the actual creating. 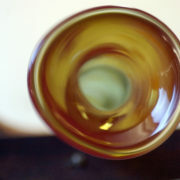 From practical making of tumblers, perfume bottles, vases, etc. 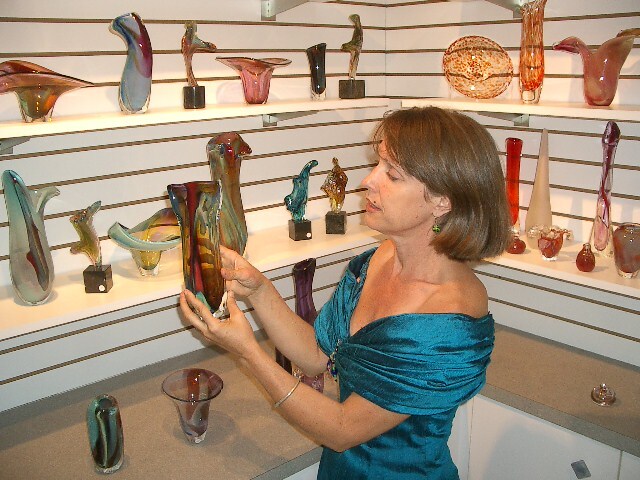 to “impractical” work of sculpture, wearable glass, and “the glass canvas”, the work has been a labor of love for me. Loud noise, heat, and hard work fed me for about 14 years, until I sold my equipment/studio in 2009. My version of having children was the nurturing of a studio and the work it produced. My nest is now empty, though the pieces live on. Out in the world, the glass pieces have their own lives in private collections, museums, municipal collections, hospital collections, etc. A kitchen window filled from top to bottom with reflection of the colors I’ve chosen, an altar-like setting honoring the work. One piece was broken at the fault of an earthquake within a week of going “home”. Another art show an entire shelf of “crème de la crème” vases were wiped out. In fact as I remember it, at each art show at least one piece would somehow get broken~ “The sacrifice”, I would casually comment. The Ventana Monthly article is advertising an event this weekend May 21 & 22, 2016 to benefit Focus on the Masters. “Where Art Lives” A self guided tour to homes in the community that house art. Many pieces that I have created are living in these collections. When you go on the tour please be sure to say “hi” to the kids. Our collection of Teal-works is such a joy, especially the marvelous light you crafted for us. Items of beauty, like dear friends, are always with us. Thanks, Teal!